The one thing that sticks out when you enter the Fallen Earth game as a newbie is the help channel. Your chat window starts rolling with questions and answers almost immediately. And as somebody who’s monitored the help channel for a long time, there is no question left unasked and only CAPS LOCK is ignored. I dare say that the presence of the help channel was one of the things that kept the game alive. It made the new player feel welcome, and it’s been said on many occasions what a friendly community this game has. The drawback of the help channel is the fact that in order to keep it functional, it has to be policed hard. Off-topic chatter or guild recruiting is usually quickly criticized and suppressed. Roleplaying has to be limited to other channels and even the use of foreign language is limited to a sentence or two stating that somebody is looking for fellow players from his country. At first this rule seems discriminatory, but it is the only way for the GMs to monitor the channel for content. The rule has indeed lead to a couple of couple of harassing statements, but even that could be stopped quickly. 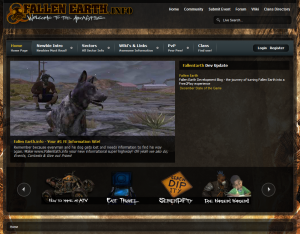 The Fallen Earth webpage has a post with frequently asked questions here, but I want to expand on it with the experience of the first 10 days since F2P. I have however some secret (and now not so secret) objections about a help channel FAQ. It’s based on the tendency of the human nature to be to lazy to research and to read and adventurous enough to go out on their own and see what happens.